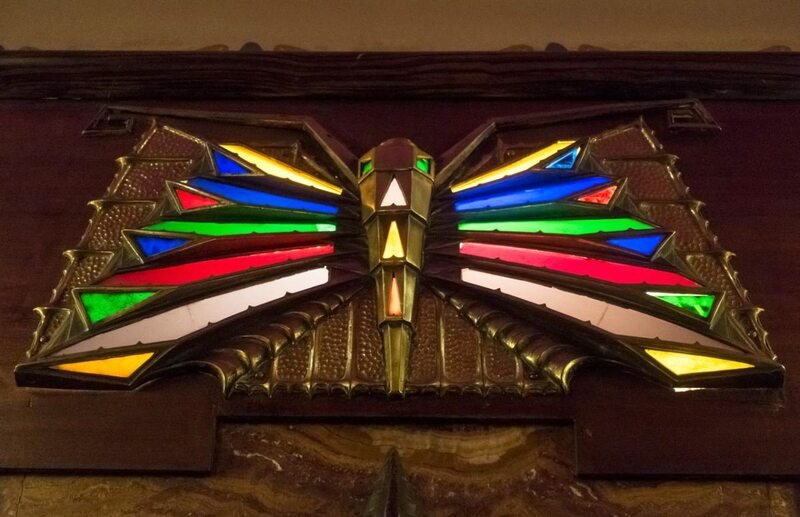 If there was ever a cinema made to be photographed for a coffee table book, the Pathé Tuschinski in Amsterdam would probably be it. Yet the city centre cinema in the Dutch capital is not just an architectural attraction in its own right, but also an active and hugely enjoyable cinema destination determined to stay relevant in the age of streaming films. Even so it is a beauty that hides a very dark secret. 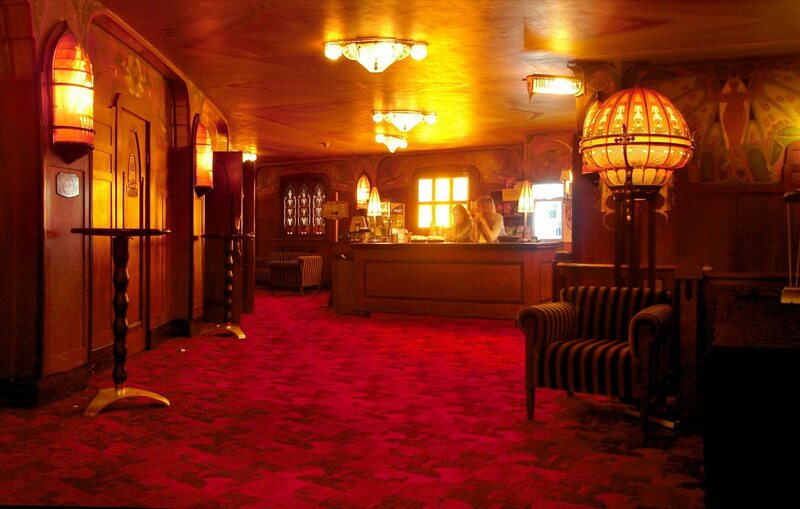 The Pathé Tuschinski lies on the Reguliersbreestraat (street) that connects the Flower Market on Muntplein and the touristy restaurants and bars of Rembrandtplein (plein means ‘square’ in Dutch) in the heart of Amsterdam. Attendees of Cinema Expo would once have passed it on the #4 tram that runs between Amsterdam Centraal station and the RAI Exhibition and Convention Centre. 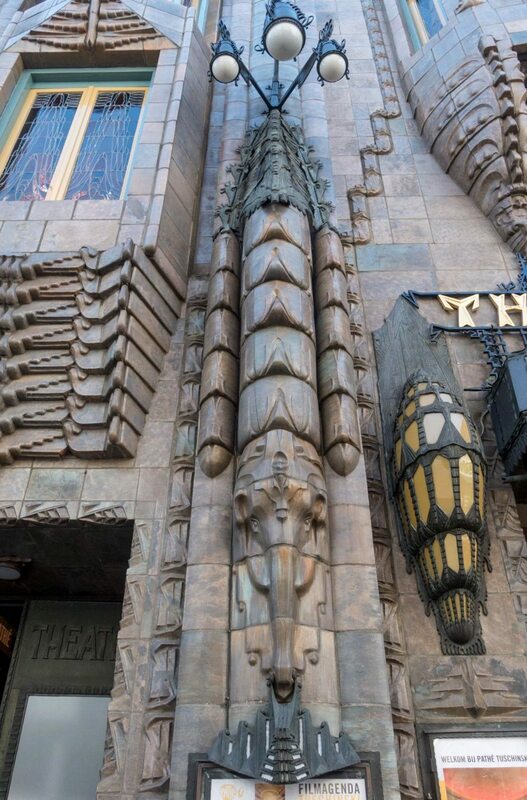 Despite being tall and narrow, the Theater Tuschinski is impossible to miss as you pass by; its carved stone exterior seems a mix of almost every architecture style going. 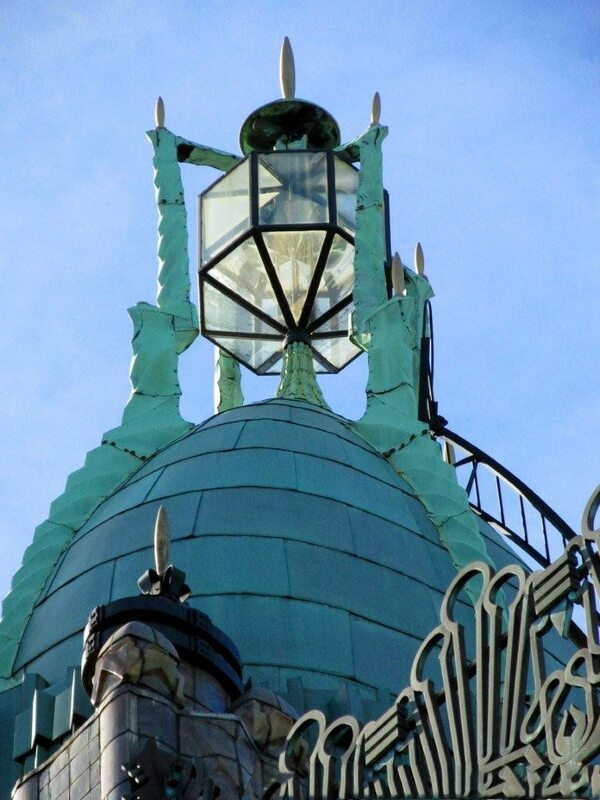 Stand across the street and gaze up at the design by Hijman Louis de Jong, who began his life as a carpenter’s apprentice and had no hesitation to mix the architectural influences of the Amsterdam School, Art Nouveau and Art Deco for what turned out to be his most famous creatio, originally opening in 1921. de Jong was later interned in the Nazi’s Westerboork transit camp, from which he wistfully wrote in 1944, “I have never missed anything, though I am imprisoned, but it also has an upside because I get to see something of the world.” He is believed to have survived Auschwitz only to die in the Theresienstadt camp a few days after the end of the Second World War. Cross the street while taking care not to get run over by the cyclists, taxis and trams criss-crossing both ways. Up close the facade at the ground level looks like what you might imagine Bruce Wayne’s parents emerging from on their last fateful visit to the cinema in Gotham (think Tim Burton, rather than Christopher Nolan or Zack Snyder). Everything from the stained glass window to the font of the lettering seems at odds with itself, but works as a whole. 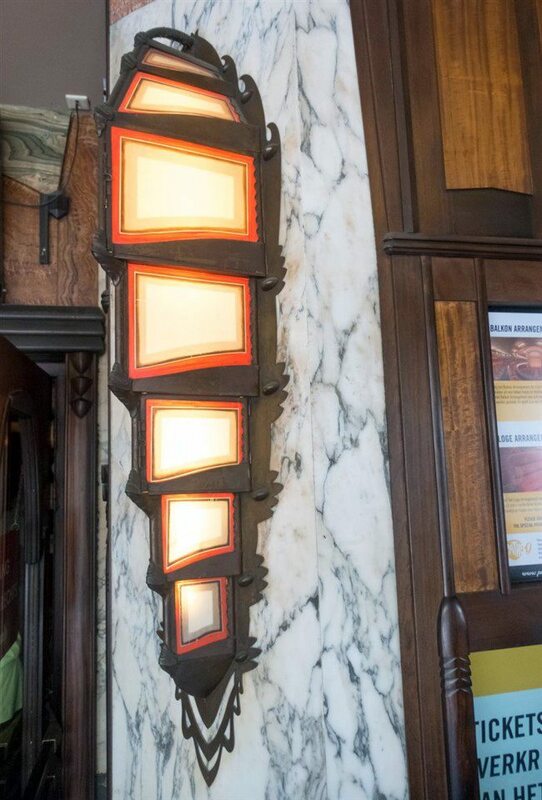 Retro red LED electronic signboards show screening times and films, while posters promote meals, opera screenings or why not a guided tour of the cinema. 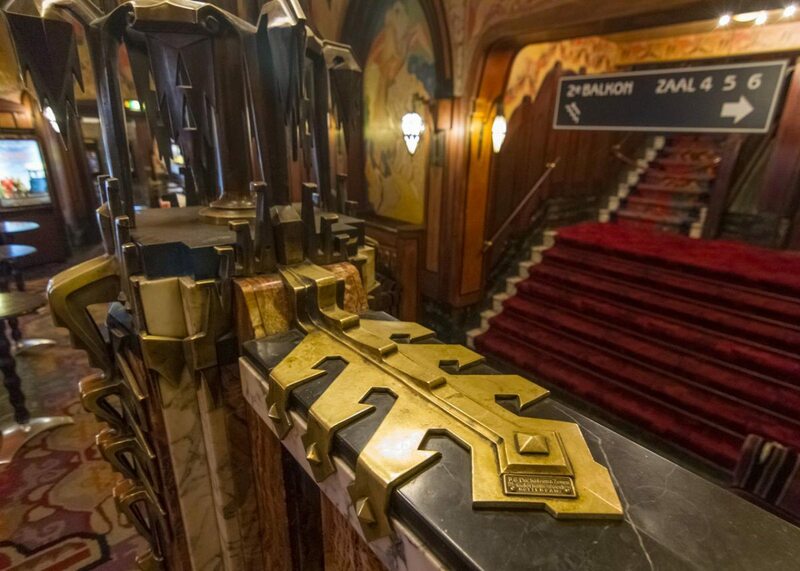 To buy a ticket you have to enter under the square stone arches into the lobby and it is here that the Tuschinski takes your breath away once more. 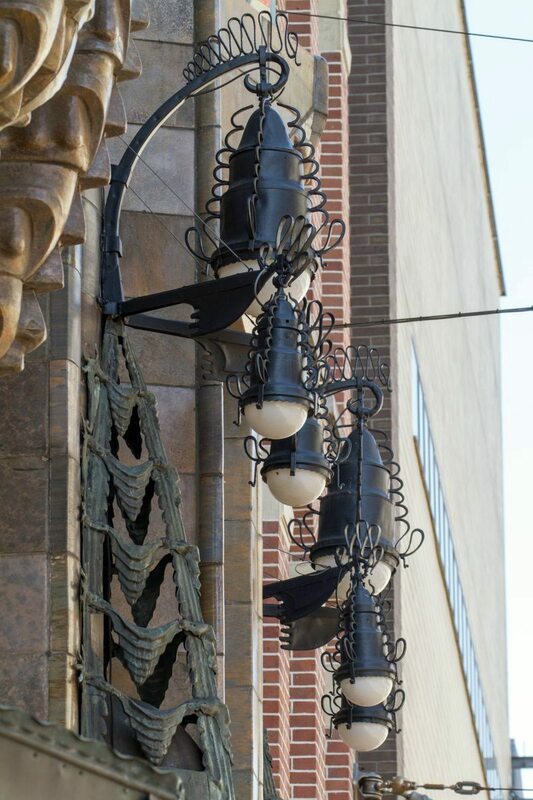 Having fallen out with his architect, Abraham Icek Tuschinski hired Pieter den Besten, Jaap Gidding and Willem Kromhout to complete the building and design the interior in Art Deco style with a hefty dose of Mitteleuropean Jugendstil, with architect DC Fold Hook and Christiaan Bartels also credited for their work. 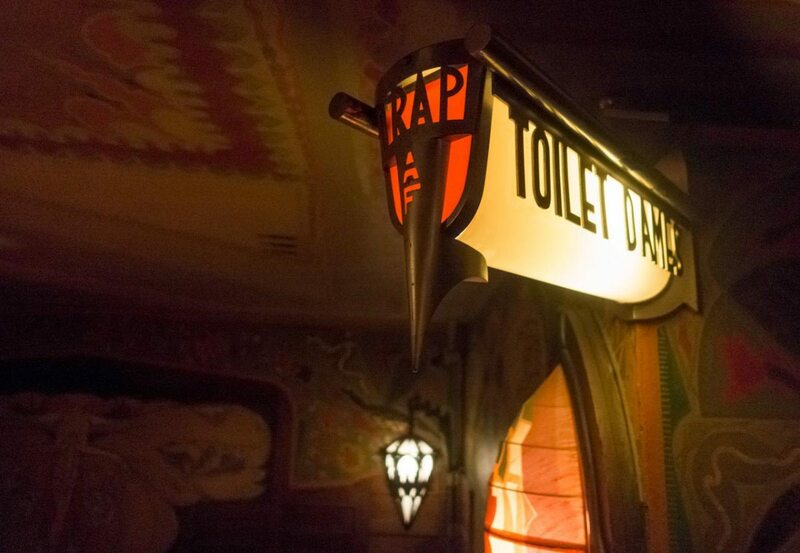 The lush and plush interior is covered in soft carpets, intricate staircases, a solid bar counter and plenty of furniture bathed in a discreet overhead light that constantly changes colours. It is almost exactly as it looked when it opened and precisely how the founder wanted it to be. When Tuschinski arrived from Russian-occupied Poland (where his surname was Tuszynski) in 1903 he was only planning a brief stopover in Rotterdam on his way to America. Having opened a Kosher cafe for Jewish passengers waiting to board the ships, he spotted another opportunity that the new cinema craze offered, opening four Rotterdam cinemas in 1911: the Thalia, Cinema Royal, Scala and Olympia. 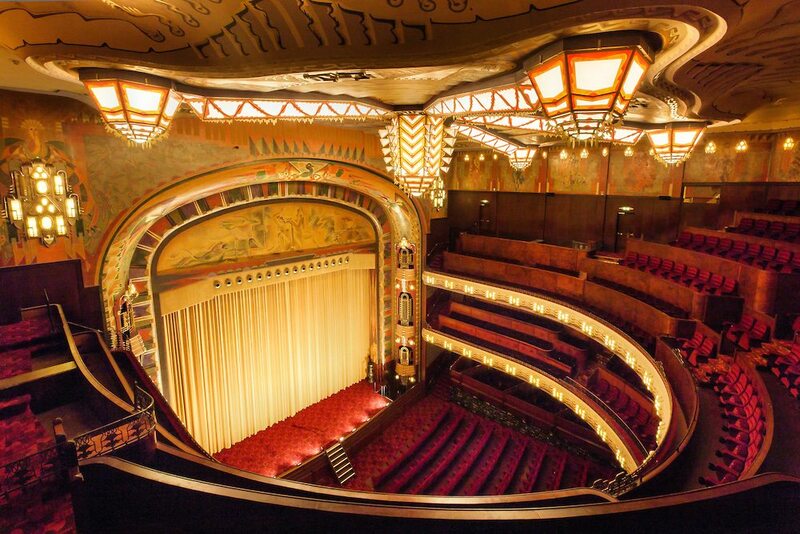 He would open Rotterdam’s aptly named Grand Theatre in 1928, the same year as his other famous Amsterdam theatre The Roxy. But it was the cinema that was to carry his name which became his legacy – until that name was removed. 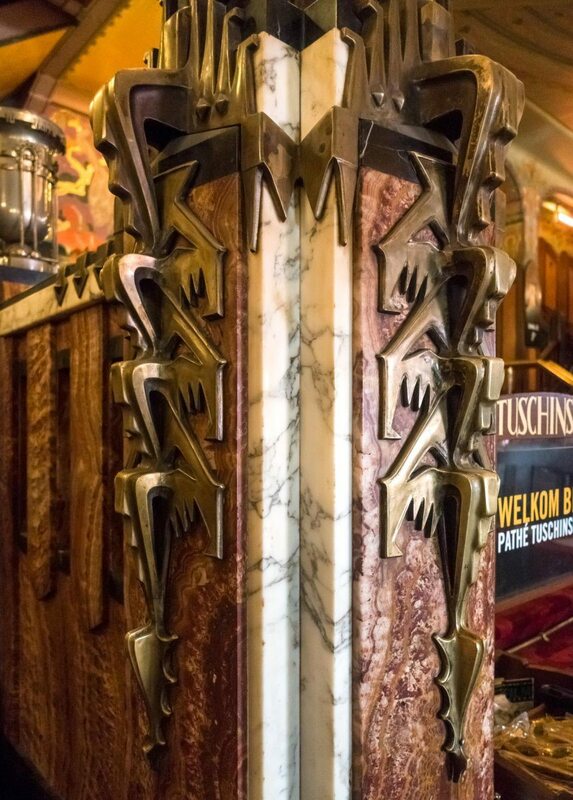 The Tuschinski is enjoyably quiet on a weekday afternoon, with most tourists happy to snap pictures and selfies of the building’s exterior, leaving the inside to older couples and the one member of staff behind the solid marble counter. Tickets and concessions are sold in the same place (Pathé of course also has a web portal), with the popcorn, Coke and chocolate candy choice expanded with caffeinated and alcoholic drinks, all served up in the friendly but no-nonsense Dutch style. Taking a photo in here doesn’t seem to be an issue; there must have been millions snapped already. 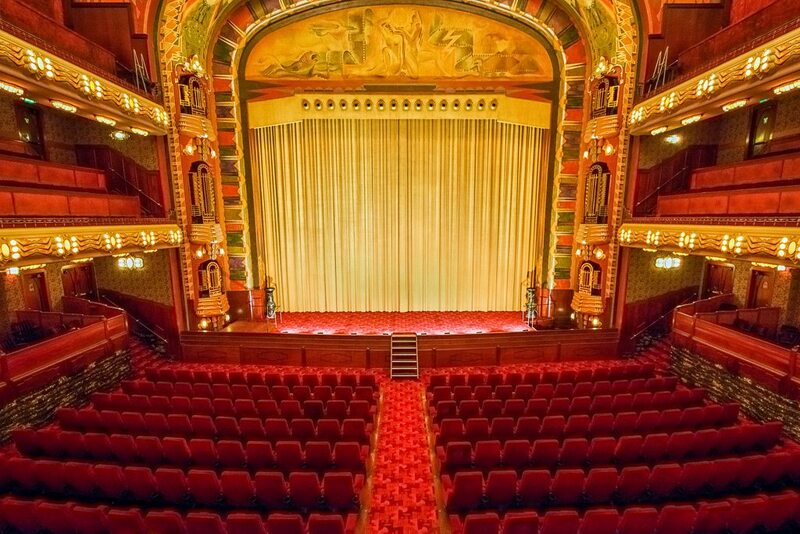 The Tuschinski has one main large screen (Grote Zaal) and five smaller screens, with 735 seats for the main auditorium and 1,431 seats in total for all screens. The sound system is Dolby Digital 7.1 and while it is unlikely to ever upgrade to Dolby Atmos or win any praise for its acoustics, both the main auditorium and the smaller screens do a perfectly serviceable job. 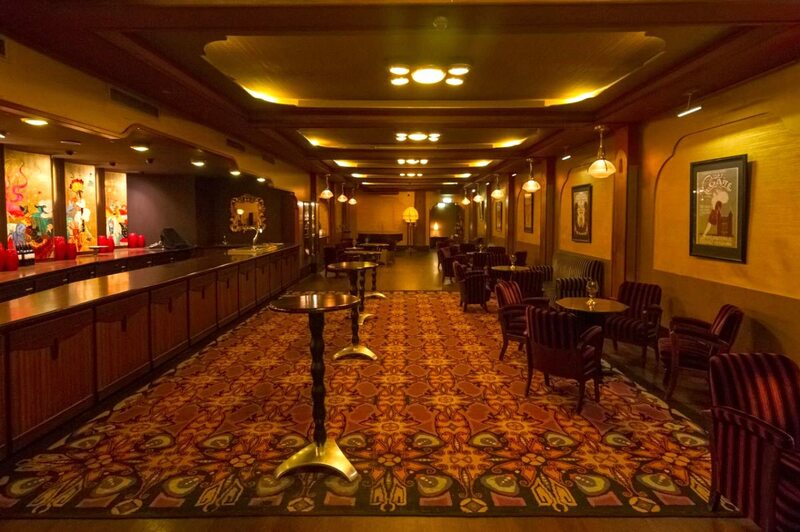 Particularly for a cinema that was built in the era of silent films. 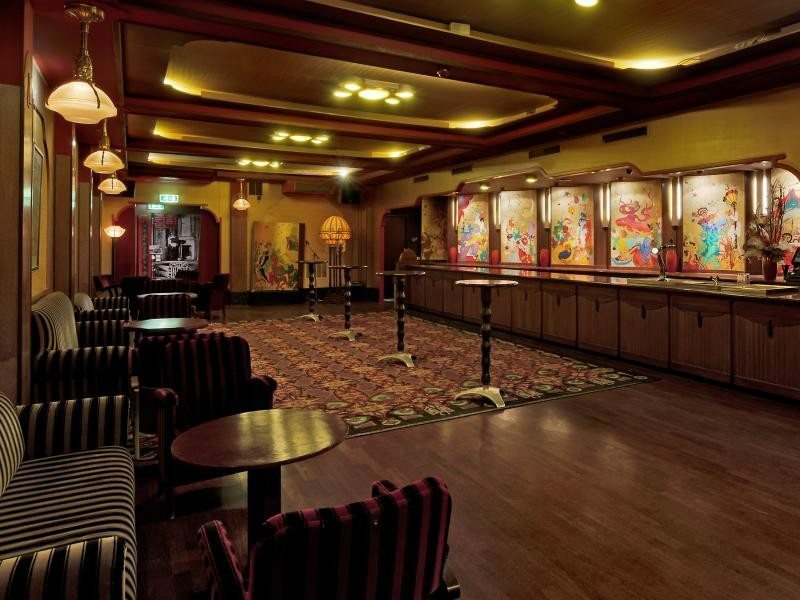 The Grote Zaal shows 3D. 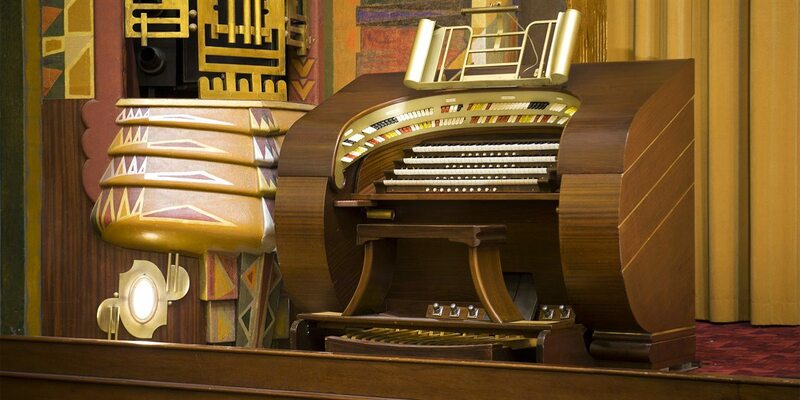 It is also used for live performances on stage – Judy Garland, Marlene Dietrich, Edith Piaf, Dizzy Gillespie, Fats Domino, Dionne Warwick are just some of the famous names to appear here – when it is not hosting film premiers. 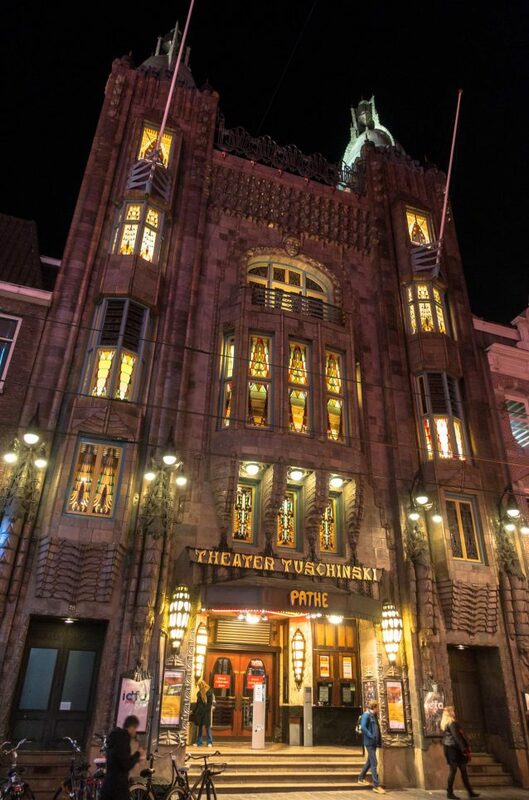 In 1917 Tuschinski moved from Rotterdam to Amsterdam and began planning the opening of the biggest cinema in all of Holland at a cost of four million guilders. As well as being design driven, it was to feature revolutionary electro-technical features and have a heating-ventilation system that kept a constant temperature throughout the building. Wikipedia says that “the lobby was designed in a way to offer theatergoers the feeling that they are stepping into an illusion.” It is as grand an entrance as any opera house and the main screen has the feeling of an opera, with not one but two balconies. Originally it had 1,200 seats, or perhaps 1,600 seats – some sources even say 2,000. The hallway curves gently around the Grote Zaal and it feels like it should be full of men in tuxedos and women holding champagne glasses in silk gloved hands. The only other cinema like this is the Avalon on Catalina Island in California (our Cinema of the Month a year ago), though it was built eight years later. 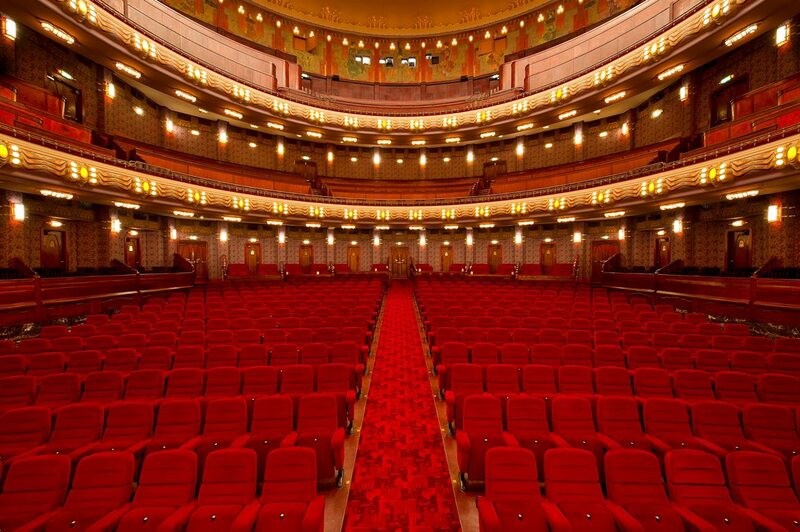 Yet there is nothing snobby about the place, but rather it says that a rarefied design can be as justifiable for a cinema as for a concert or opera hall. I make my way up the grand stairs to one of the smaller screens where “mother!” is showing this afternoon. 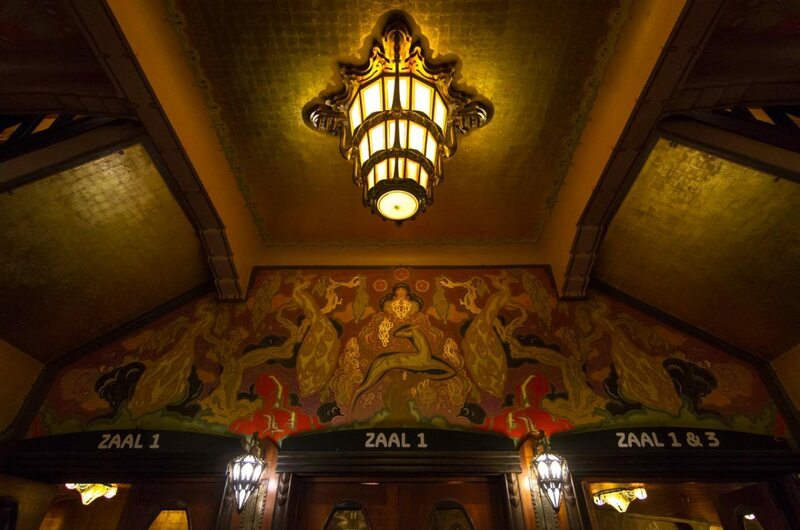 How did the Tuschinski create three additional auditoriums without sacrificing the Grote Zaal? Simple. 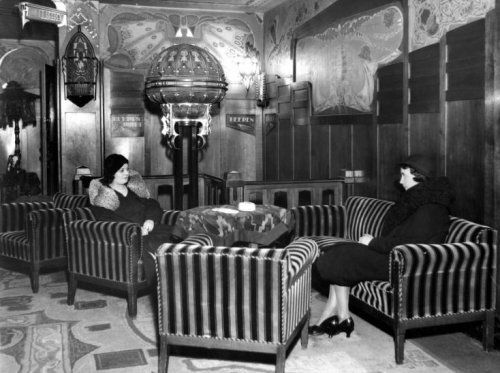 The cinemas used to have a cabaret-dinner club called La Gaité, a Japanese tea room and a Moorish suite. These were converted into cinema halls. 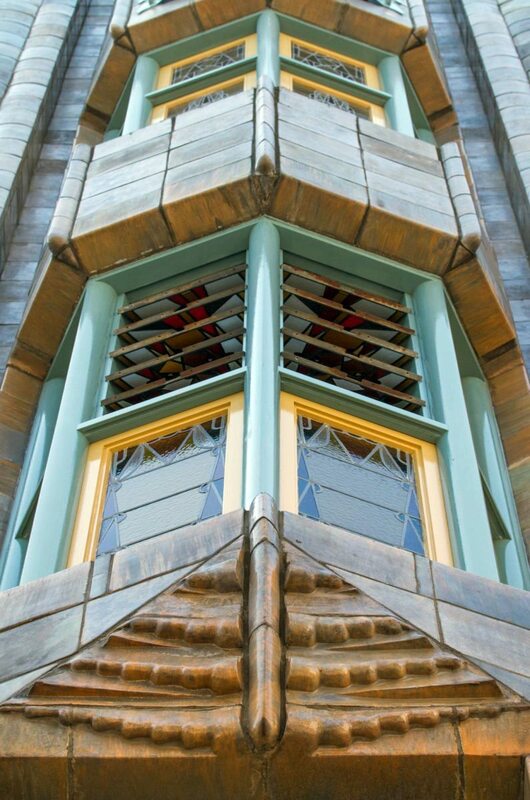 The addition of a wing to the side created three more auditoriums, for the Tuschinski to become the most unlikely city-centre multiplex. If that isn’t enough choice there is also a purpose-built multiplex, the Pathé Munt with 12 screens, next door. 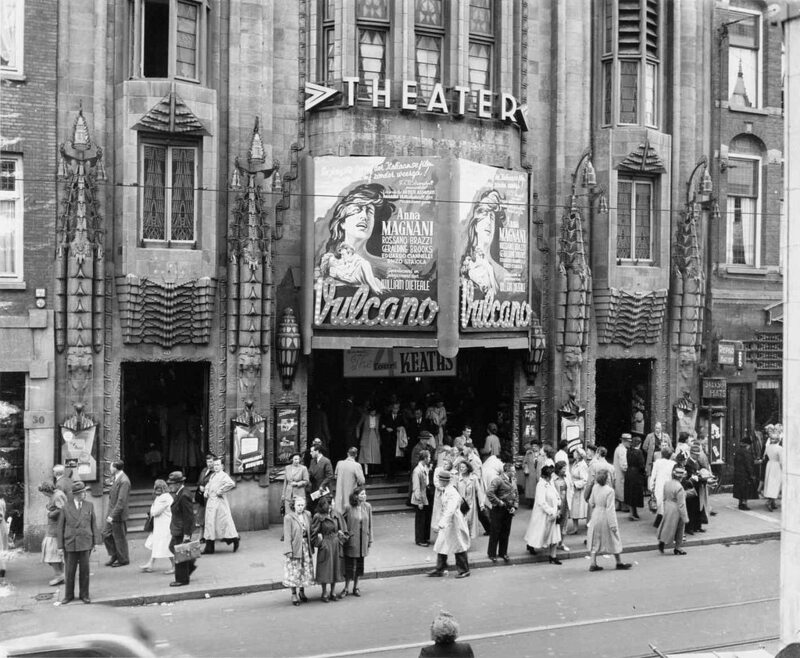 When the Second World War broke out all of Tuschinski’s cinema in Rotterdam were destroyed on the day of Luftwaffe’s Rotterdam Blitz, 14 May 1940. 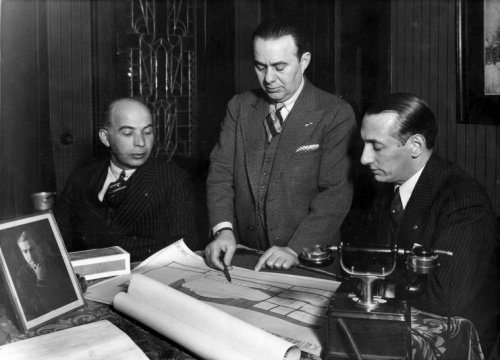 By then a costly failed venture into film production by his son (a 1936 Max Ophul film called ominously enough “The Trouble With Money”) meant that NV Tubem Company had taken over the Tuschinski group, making Tuschinski a mere employee of his eponymous cinema. 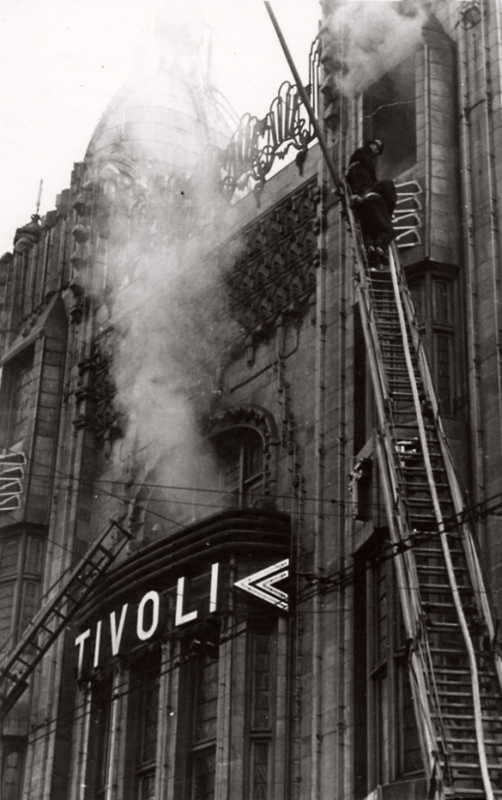 A Polish-Jewish name would not do for Nazi-occupied Amsterdam’s biggest cinema, which was given to the German company Tobis and re-named Tivoli on 15 November 1940. After that it mainly screened pro-German and anti-Semitic films. “In January 1941, even before the German’s implemented such a ban, the opportunistic Dutch Cinema Association banned Jews from all cinemas in Amsterdam,” the book “Anne Frank Silent Witness” reveals. 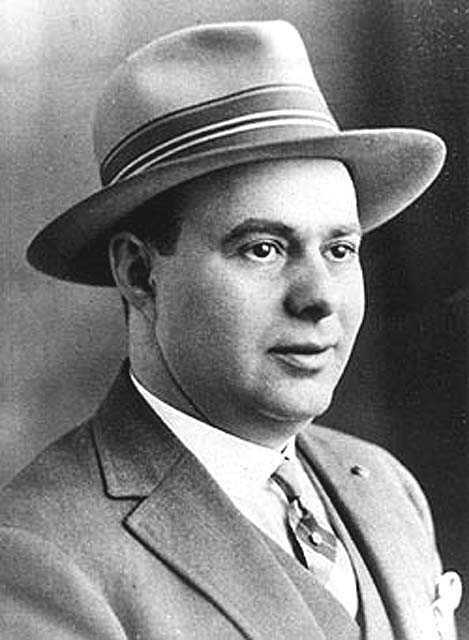 Abraham Tuschinski was exposed by an informant and arrested for having visited non-Jewish neighbours and for using a telephone. 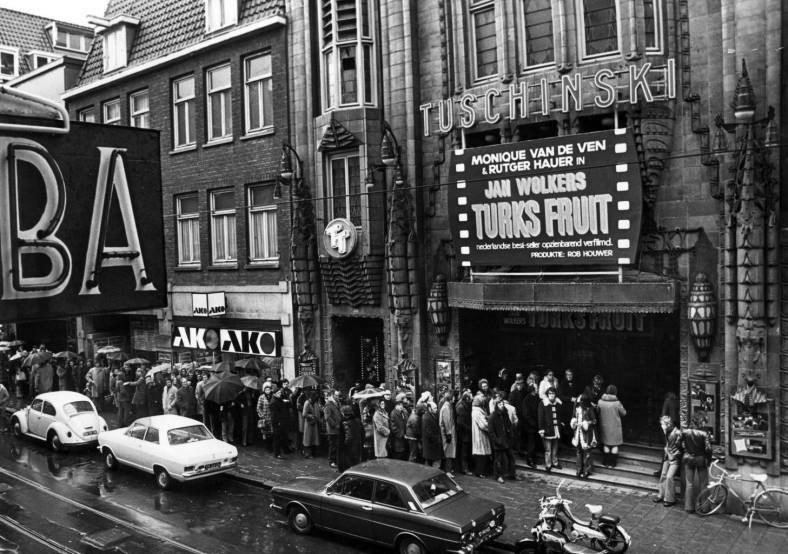 The people of Amsterdam would mutter that ‘Tivoli’ stood for ‘Tuschinski Is Verkocht Of Liever Ingepikt:’ Tuschinski has been sold, or rather snatched up. 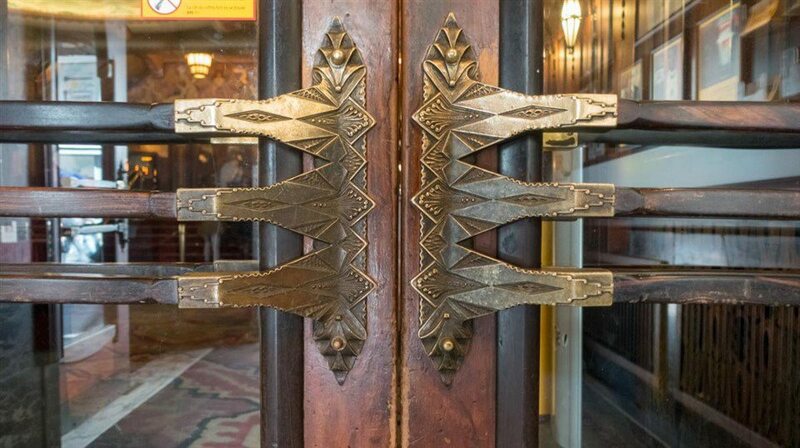 Having fled pogroms there four decades earlier, by 1942 Tuschinski and his family ended up where he had come from. Instead of Russia, Poland was now occupied by Nazi Germany, which was busy sending Jews from across Europe to its newly constructed death camps there. 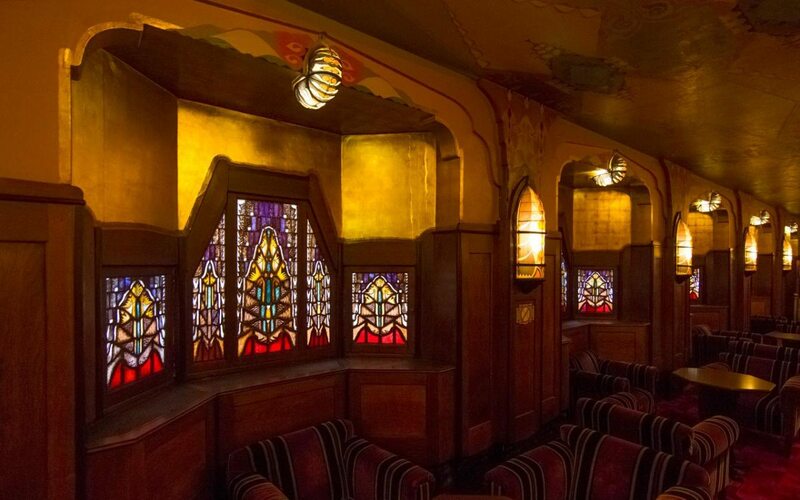 Did Tuschinski dream himself back to his magical cinema, Amsterdam’s celluloid ‘plum cake’ or ‘dowager bonbon box’, in those last moments in Auschwitz in September 1942? I’m lost for a moment. I’m not sure which former room I’m in. 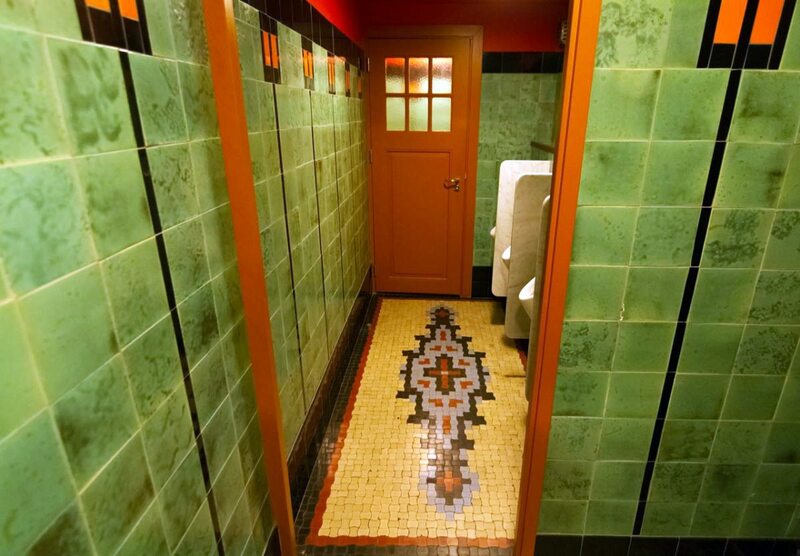 The Oriental themes leading up to it are as many as they are dazzling and confusing. There are butterfly women painted on the corridor walls. There are peacocks on the stairways and walls of the lobby. 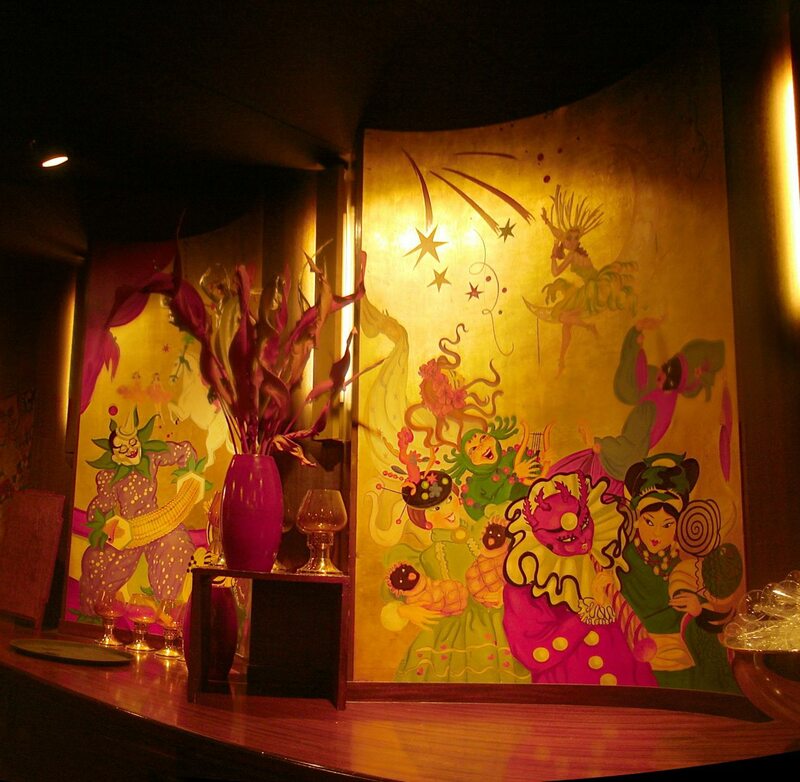 Huge decorative lamps resemble Chinese lanterns, while gold leaf designs take their inspiration from Japanese kimonos. There are inscriptions from ‘A Thousand and One Nights’. 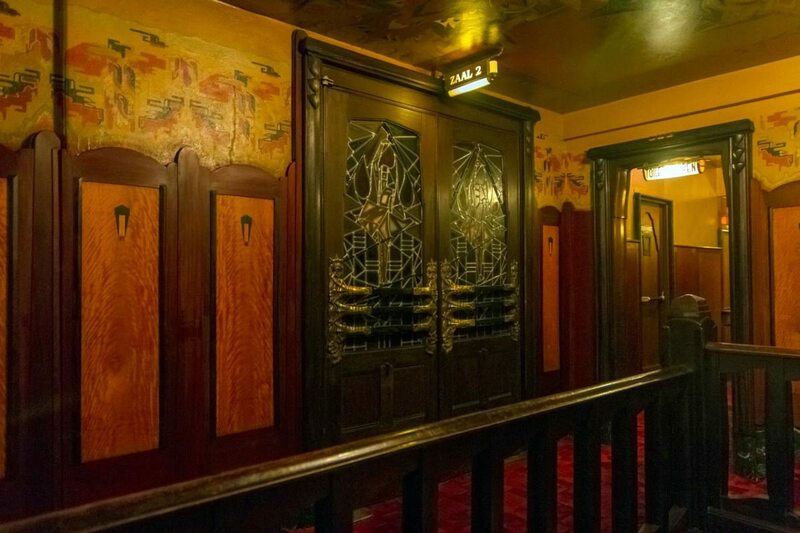 I’ve read that the original cloakroom had a Buddha statue. 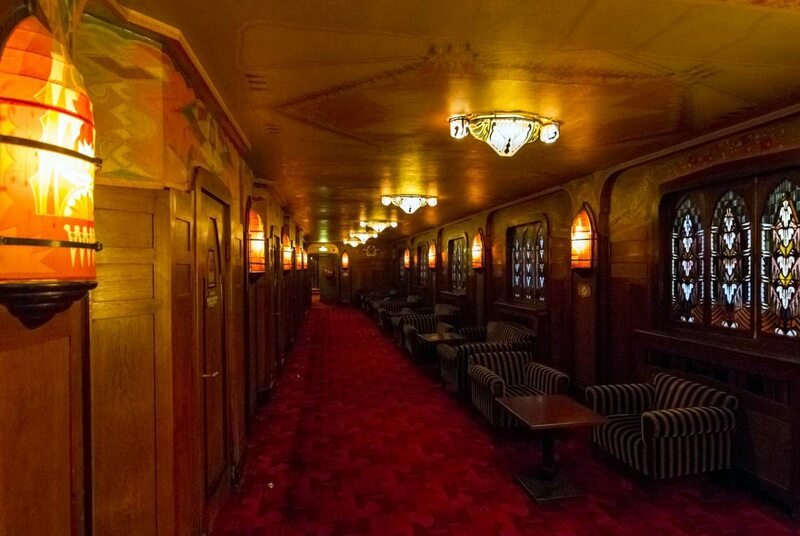 The website of the Pathé Tuschinski indicates that the disorientation might not be unintentional. 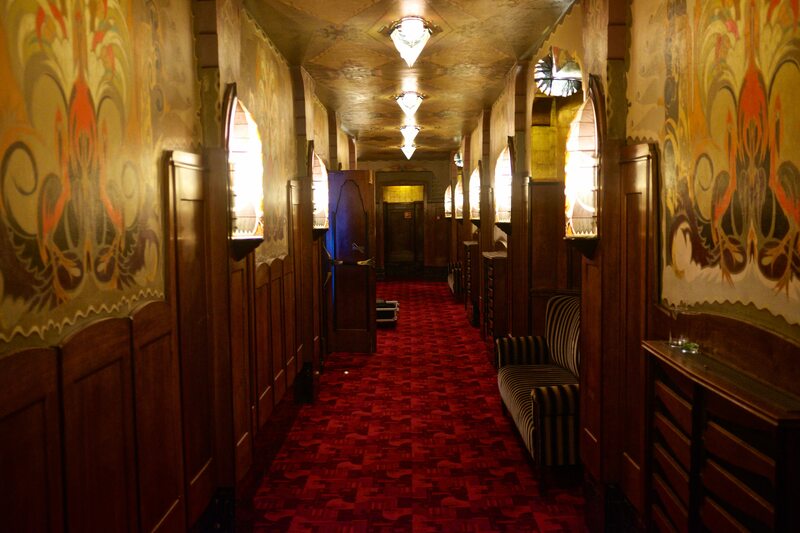 “The corridors of Tuschinski were built were not only to connect the various auditoria. 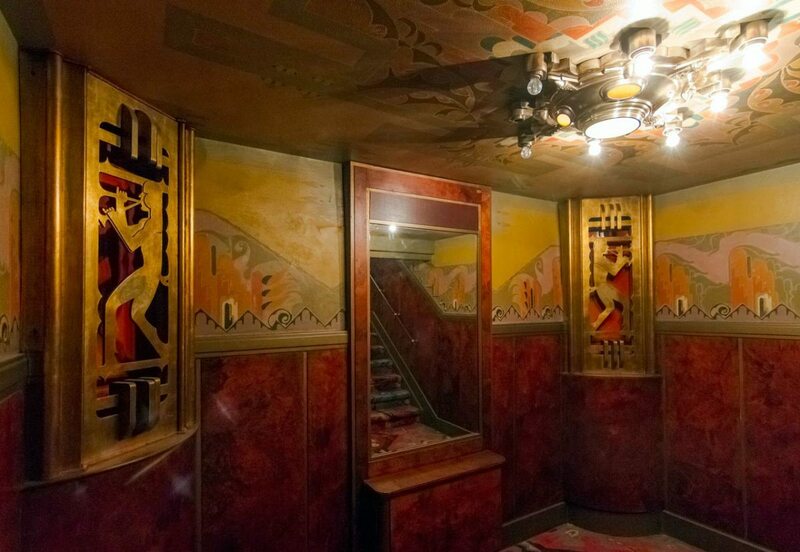 Their labyrinth was meant to offer its guest privacy.” The Tuschinski cinema is a dream to lose oneself in before the film even starts. 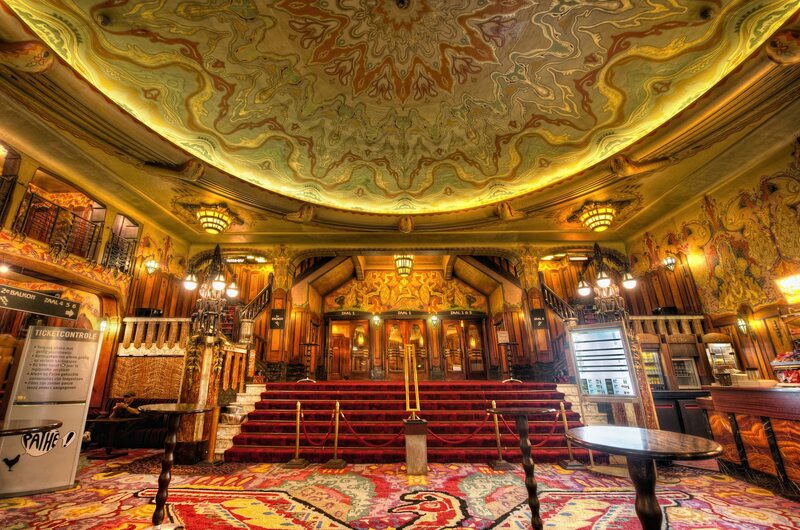 “Grand as a temple and beautiful as a palace,” is how Tuschinski himself characterised it. I sink into the comfortable chair as the auditorium slowly fills up. The tourist next to me (judging by his backpack) seems to be enjoying the cinemas complementary WiFi. Even the fevered cinematic nightmare that Darren Aronofsky is about to put Jennifer Lawrence through in “mother!” will seem tame next to the turbulent history and dizzying visuals of the cinema in which it is being projected. But unlike the film, the story of the cinema has a happy ending. 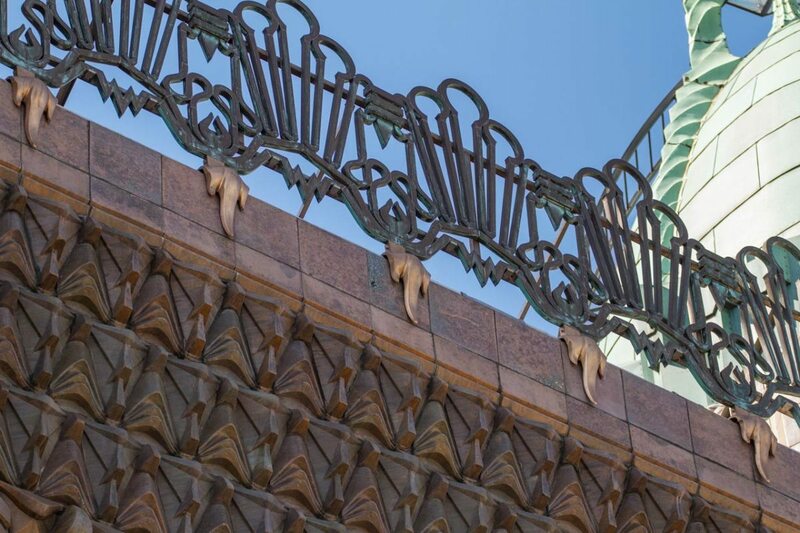 On 29 July 1945 the name Tuschinski was restored above the entrance to the cinema. 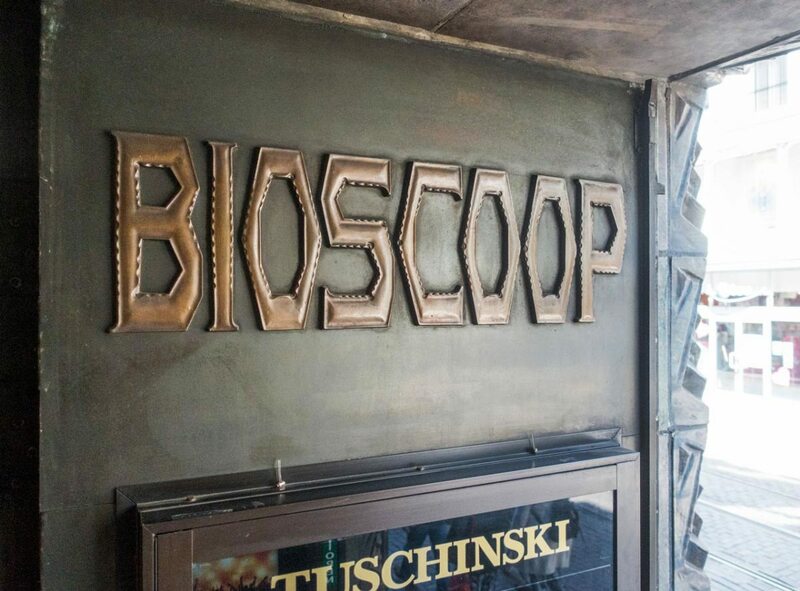 In 1949 a memorial plaque was unveiled in the cinema commemorating Tuschinski and his brothers-in-law business partners. 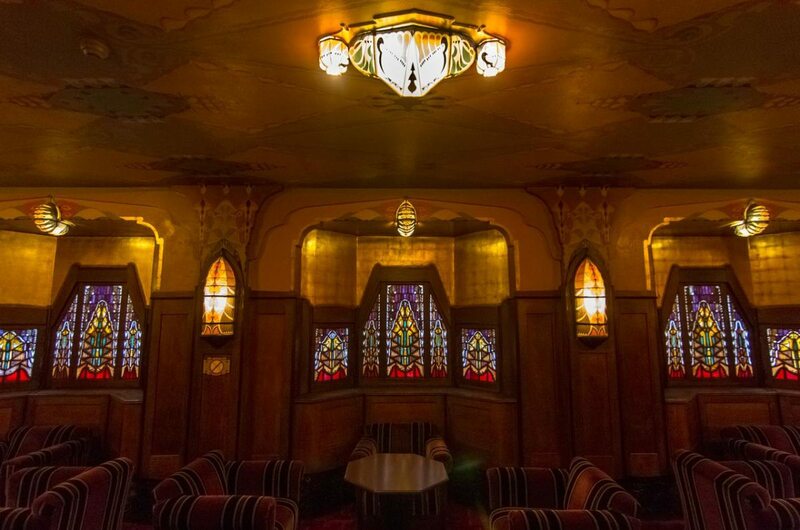 The building was first restored in 1984 when the two-inch thick 50 meter carpet for the lobby had to be flown in from Morocco on a special KLM flight. (Such was the iconic status of the cinema that KLM covered the entire USD $100,000 transportation cost.) It is still there as you walk in. 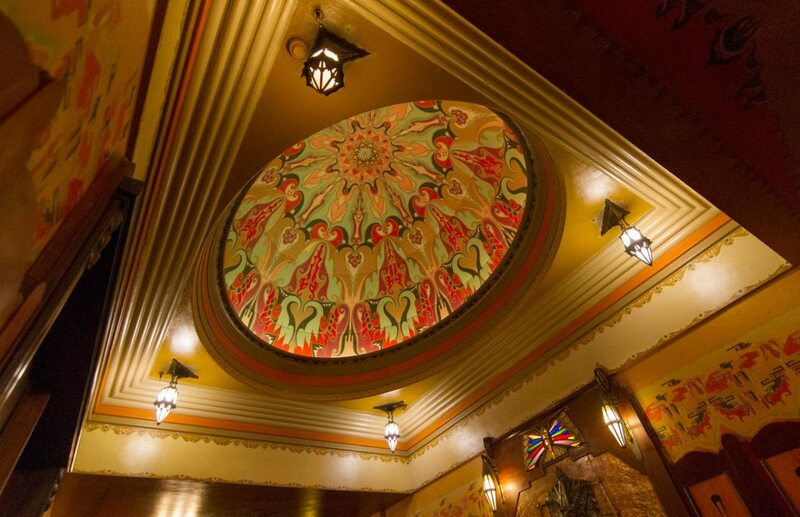 Thanks to the new owner Pathé the cinema was painstakingly renovated between 1998 and 2002 to its original style – there is even a coffee table book about the restoration: “Theater Tuschinski, Restoration of a Dream” by Rutgers, Bram & Kees Doornenbal. Stepping outside I wonder if perhaps Abraham Tuschinski wouldn’t have been happier that today his name is primarily associated with one of the most beautiful cinemas in the world, rather than alongside Anne Frank as one of Amsterdam’s 102,000 Jewish inhabitants (73% of the city’s Jewish population) who were murdered in the war. 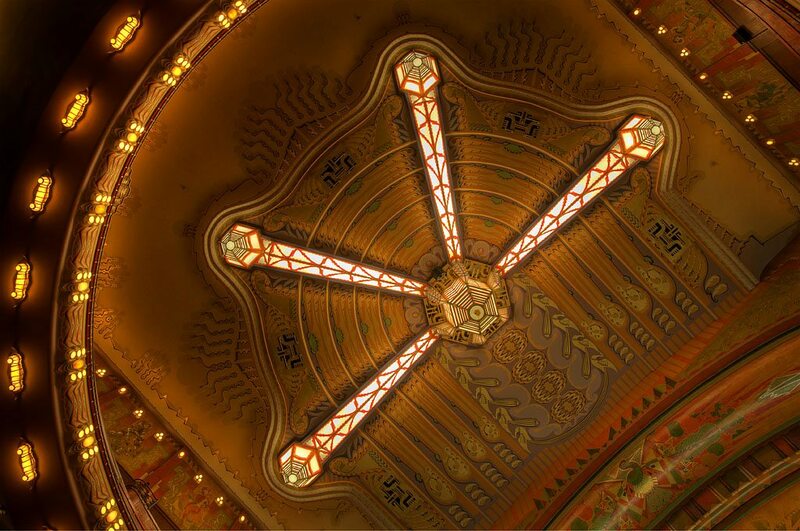 Writing in “Cinema by Design: Art Nouveau, Modernism, and Film History” design historian Lucy Fischer notes that “while Tuschinski himself perished in the Holocaust, his theater remains as a tribute to his vision and the grandeur of cinema.” Or perhaps he should give over his name to a very unique architecture and design style for cinemas: Tuschinski style. Unique, unmistakable and unmissable. Celluloid Junkie selects the CJ Cinema of the Month based on our own independent survey. We always pay for our own tickets, popcorn and Coke, and visit the cinema in a ‘mystery patron’ capacity in most cases. Whenever possible we take our own photographs of a cinema in lieu of corporate stock photos. Thus, sometimes you get authenticity at the expense of focus. Our impressions may be subjective, but we always try to be fair and factually accurate in everything being presented about one of the cinemas we have chosen.